In my second message as Worshipful Master, I want to bring those of you who don’t attend lodge up to date on some things going on at the lodge. First, we said goodbye to one of the pillars of Annapolis lodge, Worshipful Brother Ray Cook, PM as he laid down his working tools and passed to the Celestial Lodge Above on January 17, 2019. PM Cook taught catechism to several of our brothers at his house over the years and was inducted into the Grand Lodge Instructive Tongue Society. PM Cook was thankfully able to attend installation and his presence was greatly appreciated and he will be greatly missed. Secondly, we are getting ready to raise four men to the sublime degree of Master Mason in March. One of these men will be returning to the Philippines so we are going to raise him here before he leaves. I hope to have the degree on March 5th as a Special Communication and would like to see the lodge full of brothers. Check the online Trestleboard for confirmation. This will be our first degree of the new year and we should be having an Entered Apprentice degree soon after as well, as we have received a few petitions for membership recently. Next, progress on the grant money for the re-pointing of the bricks and the replacement of the front windows, after going through a review by the Historical Society, is on hold until some of the information presented in our plan is explained more in depth. For those not aware, the state granted us $80,000 to undertake some repairs on the footprint of our building. Brother Peter Lord is heading up this project and will be addressing the concerns that they have brought up so the work may proceed and give our lodge a much-needed facelift and protection from further deterioration. Another issue we have with our building is that on the left side of the building, the side closest to Duke of Gloucester street, part of the wall near the top has been bowing out. After review by a structural engineer, a plan was developed to address this issue and will cost the lodge approximately 20-25 thousand dollars. This repair is imperative! If the bowing becomes worse, that section of the wall could collapse and fall onto our neighbors’ roof. As this is a considerable expense, I am urging brothers who have yet to pay their dues to get them in as soon as possible. Our lodge cannot function without your support. 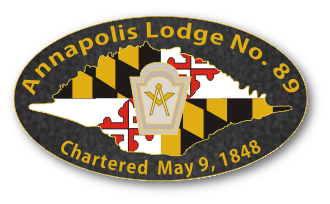 The support of all brothers both financially and physically is essential to the longevity of Annapolis Lodge. On another note, if you are not yet a Scottish Rite Mason, the Baltimore Valley is holding a one-day class in honor of our brother, Past Grand Master Bennie G. Owens. This class will be held on March 16th, 2019. As a Scottish Rite brother, I think it is a fitting tribute to our Brother and friend. If you have been considering joining the Scottish Rite, this would be a perfect opportunity, and you go through on one day! March also brings our Festive Board and planning for our Open House. I hope to see more brothers come out and support the lodge!